Put money in your pocket and great wine on your table with this month’s $1 Shipping Spring Wine Sale at The California Wine Club. If there is any one blessing in a natural disaster the scope of the recent 8.8-magnitude earthquake just off the coast of Chile, it's that a remarkably small number of people - fewer than 1,000, it is hoped - died in the mammoth temblor, particularly when compared with the giant but smaller (7.0) quake that had devastated Haiti in January, where the toll was an estimated 230,000. By all accounts, Chile was spared a greater toll by a concentrated effort to build and enforce strong earthquake-resistant building codes since the 9.5-magnitude Valdivia 'quake there in 1960, which at the time was rated as the greatest earthquake ever recorded. With gratitude that lives were spared, Chile nevertheless faces a massive economic impact from the 'quake. Its wine industry alone, a major player in the national economy - it ranks 10th in the world in overall production - may be heavily hit. Chile's telecommunications were so heavily hit, AP said, that days after the event, investors in the vineyards "that carpet the hardest-hit areas couldn't reach winery employees by phone or Internet to discuss the upcoming harvest." "You have to get grapes from the vineyards to the winery, and I don't know the condition of the roads around the winery," reported Mark Osmun, spokesman for California's Jackson Family Wines, which owns Vina Calina winery in the devastated Talca region about 65 miles from the epicenter." AP continued, "the quake has already forced tens of thousands into unemployment with no end in sight in the nation's south-southwest area ... It also translates into higher wine production costs for an industry already hurt by the declining value of the U.S. dollar." "The area with the largest impact is the heartland of wine production. Our company, as well as the rest of the industry, have been heavily impacted by this catastrophe. "With the information to which we have access at this moment, there are fortunately no personal tragedies amongst our employees and their families. However we have already been able to assess serious damage to some of our main wineries which are located in the worst affected areas. This includes important loss in wine and production capacity. A more detailed assessment of the exact magnitude of these damages is currently being completed. "Faced with this event of force majeure, Vina Concha y Toro has had to temporarily suspend all of its logistic and production operations for at least one week. All our efforts are dedicated with regard to assessing the scope of this unprecedented event and resuming normal operations as soon as possible. "We are sincerely grateful to all our customers and friends for their messages of solidarity and concern. We trust to have your understanding for the challenges that this event will cause in terms of future operations and we are certain that with your support and with the human capacity and strength of Concha y Toro we will overcome these difficult circumstances." In a salute to Chile's beleaguered wine industry, we sampled a Concha y Toro Carmenere with dinner, raising a glass in the direction of not merely the vineyards but all the suffering Chilean people. My tasting notes are below. FOOD MATCH: Good on one occasion with chicken pot pie, on another with local Barr Farm natural beef burgers with a touch of Southwestern spice. VALUE: Hard to beat for 10 bucks, although my local price is actually at the high end of its range in the U.S., where you'll find it in many markets for $7 or $8. WEB LINK: Here's a link to the winery's Website. It's published in English and Spanish; choose "Enter" for the English pages. 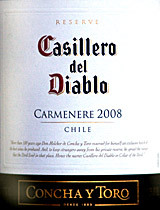 Compare prices and find vendors for Casillero del Diablo Carmenere on Wine-Searcher.com.